Daniel H. Peterson The Looking-Glass: Being a True Report and Narrative of the Life, Travels, and Labors of the Rev. 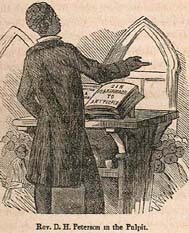 Daniel H. Peterson, a Colored Clergyman; Embracing a Period of Time from the Year 1812 to 1854, and Including His Visit to Western Africa. African American clergy -- Africa, West. African American clergy -- Liberia. Free African Americans -- Colonization -- Liberia. Liberia -- Description and travel.